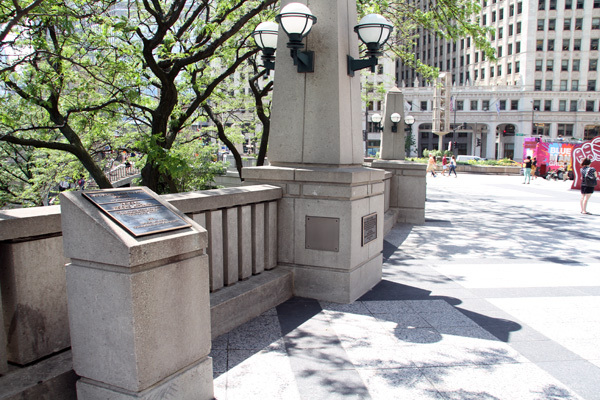 The Pioneer Court is a small plaza located near the junction of the Chicago River and Upper Michigan Avenue in Chicago’s Magnificent Mile. It was developed cooperatively by the Chicago Tribune and the Equitable Life Assurance Society of the United States in commemoration of the pioneers who contributed to Chicago`s birth, growth and greatness. 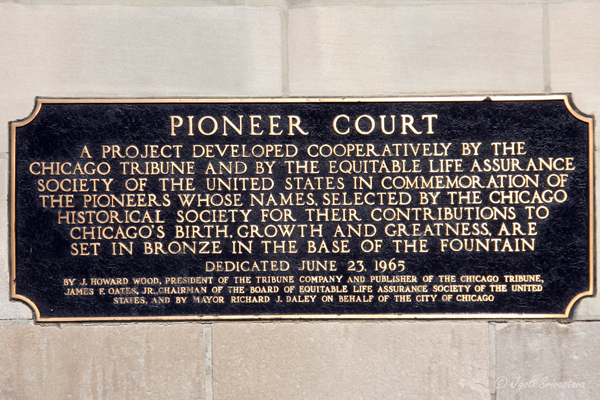 A project developed cooperatively by the Chicago Tribune and by the Equitable Life Assurance Society of the United States in commemoration of the pioneers whose names, selected by the Chicago Historical Society for the contributions of Chicago’s growth and greatness, are set in bronze in the base of the fountain..
25 such pioneer names were selected by the Chicago Historical Society. These names were set in bronze near a fountain that used to exist here, but no longer exists. These names are: Jane Addams, Philip Danforth Armour, Daniel Hudson Burnham, Richard Teller Crane, John Crerar, Steven A. Douglas, Marshall Field, William Rainey Harper, Carter Henry Harrison, Gurdon Saltonstall Hubbard, William Le Baron Jenney, John Kinzie, Cyrus Hall McCormick, Joseph Medill, Walter Loomis Newberry, William Butler Ogden, Potter Palmer, George Mortimer Pullman, Julius Rosenwald, Martin Antoine Ryerson, Jean Baptiste Point Sable, Charles Henry Wacker, Aaron Montgomery Ward, John Wentworth, John Whistler. Among them are seven who arrived in Chicago before 1836, namely Gurdon S. Hubbard, John Kinzie, Walter Loomis Newberry, William B.Ogden, Pointe du Sable, John Wentworth and John Whistler. There is also a plaque marking the site of a time capsule. 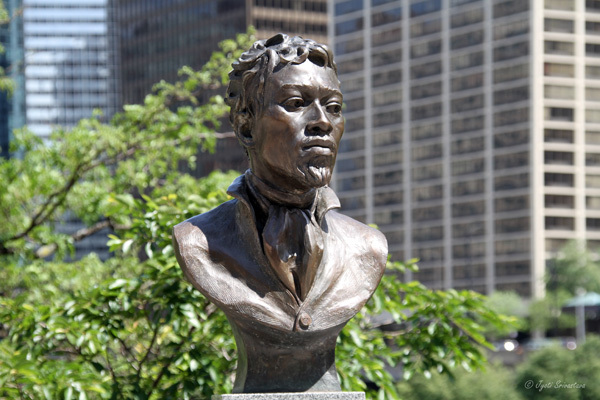 Jean Baptiste Pointe du Sable [1745 -1818], popularly known as “The Father of Chicago”, was the first known settler in the area which is now Chicago, Illinois. Du Sable was recognized by the State of Illinois and the City of Chicago as the “Founder of Chicago”, on October 26, 1968. 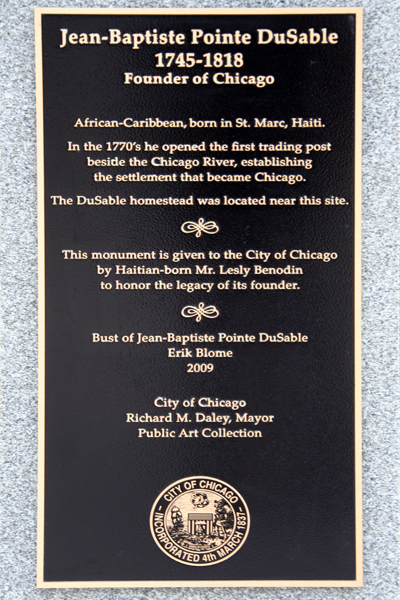 Jean Baptiste Pointe DuSable [1745-1818] / Founder of Chicago / African-Caribbean, born in St.Mare, Haiti / In the 1770’s he opened the first trading post, beside the Chicago River, establishing the settlement that became Chicago. The DuSable homestead was located near this site. 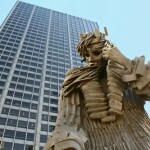 This monument was given to the City of Chicago by Haitian-born Mr. Lesley Benodin, to honor the legacy of it’s founder. 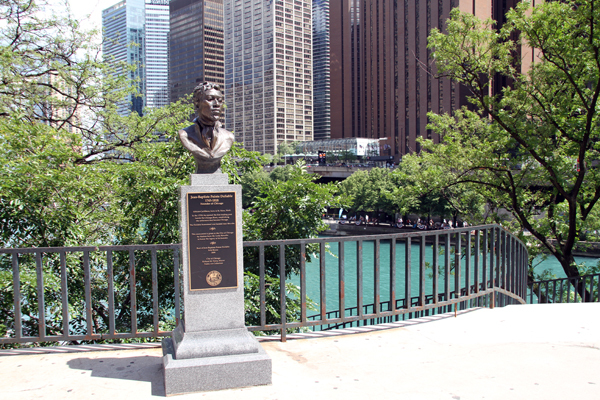 Bust of Jean Baptiste Pointe DuSable / Erik Blome / 2009. City of Chicago / Richard M Daley, Mayor / Public Art Collection. Jean Baptiste Point Du Sable Homesite has been dedicated a National Historic Landmark. This site possesses national significance in commemorating the history of the United States of America. 1977, National Park Service, United States Department of the Interior. 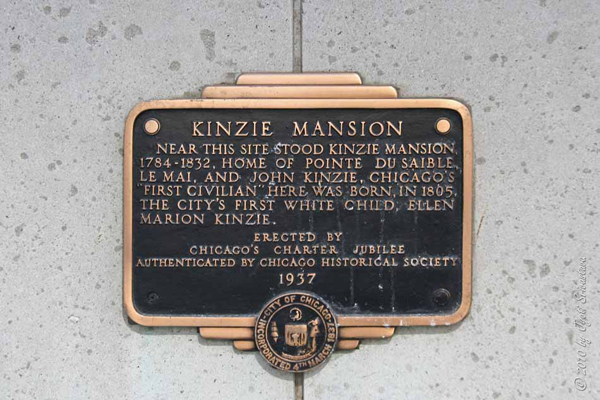 Near this site stood Kinzie Mansion 1784-1832, home of Pointe Du Sable, Le Mai, and John Kinzie. Chicago`s `First Civilian’ Here was born, in 1805, the city`s first white child, Ellen Marion Kinzie. 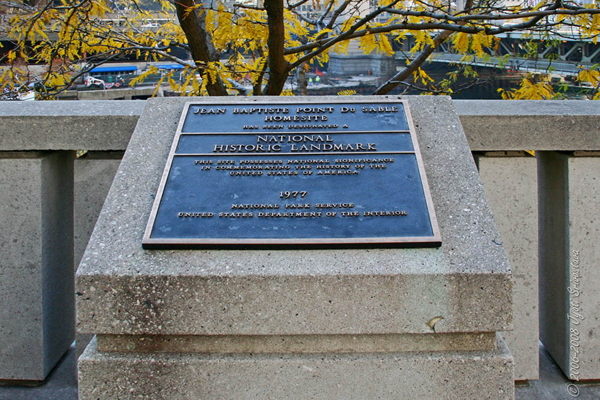 Erected by Chicago`s Charter Jubilee – Authenticated by Chicago Historical Society – 1937. 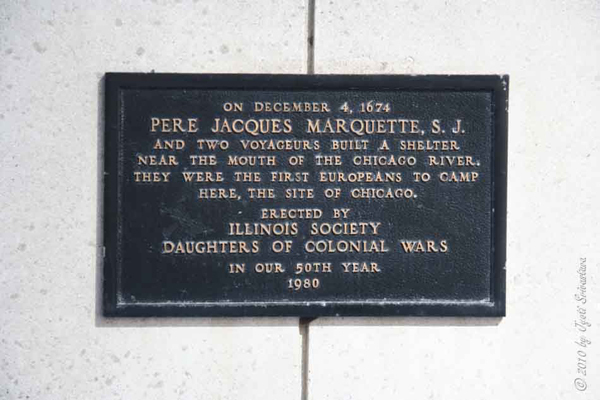 First Europeans to camp here..
On Dec 4, 1674, Pere Jacques Marquette, S.J. and two voyageurs built a shelter near the mouth of the Chicago River. 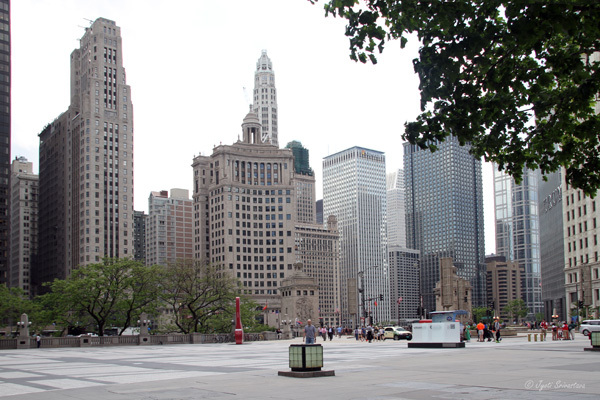 They were the First Europeans to camp here, the site of Chicago. Erected by Illinois Society Daughters of Colonial Wars in our 50th year 1980. 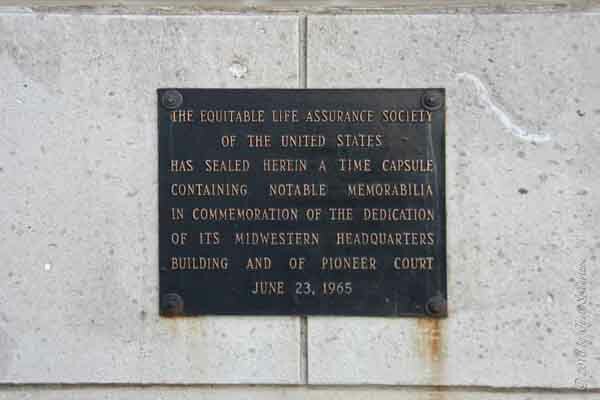 The Equitable Life Assurance Society of the United States has sealed herein a time capsule containing notable memorabilia in commemoration of the dedication of its Midwestern Headquarters Building and of Pioneer Court, June 23, 1965 “. 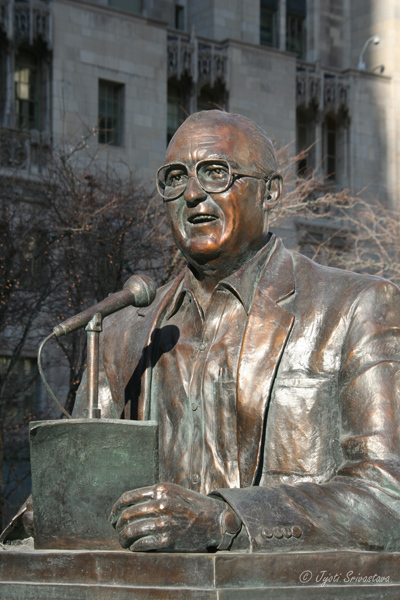 Jack Brickhouse Memorial “Hey-Hey” – by Jerry McKenna. Jack Brickhouse: Inducted into Media Wing of Baseball Hall of Fame, Cooperstown, N.Y. in 1983 and 13 other Halls of Fame throughout the nation. Broadcaster for Chicago Cubs – 40 years, Chicago White Sox – 27 years, Chicago Bears – 24 years, 1st TV voice for Chicago Bulls. 1962 – play-by-play announcer for 1st satellite telecast. Recipient of Local and International awards for Pope Paul VI papal audience. EXCLUSIVE Broadcast interviews – 6 Presidents.4 Honorary Doctorates. 2 Autobiographical Bestsellers: “Thank You for Listening” and “A Man for All Seasons”. 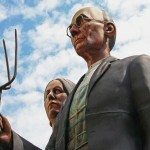 For more o this memorial, click here..
An important feature of he Pioneer Court is that it has been a site for rotating temporary art installations..click here..